Preheat oven to 350 degrees. Spray a large baking dish with cooking spray, and set aside. Spray a large skillet with cooking spray. Sauté the onions, garlic and mushrooms in 1/2 cup water, stirring occasionally until the water is completely evaporated. Remove onions and mushrooms from pan and place in a medium bowl. If using frozen green beans, thaw the green beans in the microwave for 5 to 10 minutes, or until thawed. (If using fresh, steam green beans, snip off the ends, and place beans in a large pot of boiling water for about 5 minutes, or until tender, and drain). Add green beans to the bowl with the mushrooms and onions. Let cool to room temp before adding sauce mixture. In a small bowl, mix ingredients together to make the sauce. 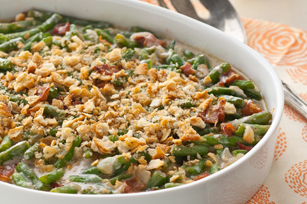 Add sauce to the green beans, and toss until everything is well coated in the sauce. Add everything to prepared baking dish. Mix topping in a small bowl, and sprinkle evenly over the top. Bake (uncovered) 35 to 40 minutes or until topping is golden brown. Serve warm.